Hyperbaric and Undersea Medicine - specialized branch of medical science dealing with the study of the physiology of diving, prevention, diagnosis and treatment of diseases associated with the influence of the underwater environment on the human body, the use of hyperbaric oxygen therapy for the treatment of pathological conditions. 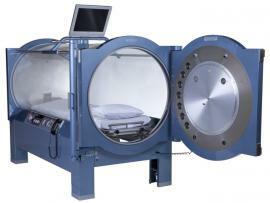 In Hyperbaric Medicine is used method is hyperbaric oxygenation, which is based on the glut of blood by oxygen by increasing the pressure in a confined space. Thanks to this effects, the blood significantly is enriched a gas and at the same time begins to circulate more quickly. This contributes to an accelerated transportation oxygen to the cells and tissue regeneration. Hyperbaric oxygen therapy is performed in a pressure chamber, where is artificially created excess atmospheric pressure of desired value and parallel is supplied oxygen-enriched air. Typically, the session lasts only several minutes. In all diseases, when the delivery of oxygen to organs and tissues is broken, develops hypoxia (oxygen starvation). The vital organs are very sensitive to lack of oxygen and can not function properly at its deficit. HBO renders a number of effects, favorably affecting the patient's condition: antiedematous action; anti-inflammatory; accelerates the wound process, promotes proliferation of vascular capillaries and restores a blood flow in organs and tissues. HBO normalizes collagen synthesis, accelerates the formation of bone callus, eliminates the phenomenon of osteoporosis and so on. Vascular pathology: obliterating diseases of limb vessels, sores as a result of circulatory disorders, gas embolism vessels and so on. Heart disease: arrhythmic version of ischemic heart disease (IHD), angina, arrhythmia, ekstrasistolii, heart failure, decompensation of post-infarction states, intoxication by a cardiac glycoside, pulmonary heart disease, and so forth. The pathology of the gastrointestinal tract: stomach ulcer and duodenal ulcer, posthemorrhagic syndrome after gastric bleeding, bowel disease. Hepatic disease: acute hepatitis, chronic hepatitis, cirrhosis, liver failure. The pathology of the nervous system: ischemic insult, craniocerebral injury, encephalopathy, spinal cord injury, pareses of peripheral nerve. Poisoning: carbon monoxide poisoning, botulism, cyanides. Ocular pathology: circulatory disorders of the retina, diabetic retinopathy, dystrophy of optic nerve in case of poisoning with methyl alcohol. Pathology of the endocrine system: decompensated insulin-dependent diabetes, diabetic complications, diffuse toxic goiter. Oral and Maxillofacial Pathology: periodontal disease, necrotizing gingivitis and stomatitis, healing after plastic surgery. Gynaecology: chronic inflammatory diseases of the pelvic organs in women. A significant improvement in sexual function in elderly men after completion of HBO. Obstetric Pathology: intrauterine fetal hypoxia, the threat of miscarriage, fetal hypotrophy, pregnancy at concomitant pathology, the pathology of the endocrine system in women, infertility of various etiologies. Pathology of the newborn: birth asphyxia, hemolytic disease of the newborn, necrotizing enterocolitis. Wound pathology: the prevention of wound infection, burn wound surfaces, frostbite, postoperative wounds in plastic surgery and others. Radiation injuries: radiation osteonecrosis, myelitis, enteritis; the patients, receiving chemotherapy and radiotherapy at oncologic diseases. Chronic disorders of the central nervous system. It such diseases as epilepsy, encephalopathy, schizophrenia and others, at which there is a probability of loss of consciousness with a convulsive syndrome. Problems with the cardiovascular system. Various heart defects, cardiomyopathy, arrhythmias, and other, implying the risk of developing heart failure and cardiac arrest. Diseases of the respiratory system: asthma, pulmonary disease of varying severity, and other diseases that can lead to the risk of suffocation. Diseases of ENT organs - impaired patency of of the Eustachian tubes, symptomatic vestibulopathy and disease, as a result of which can occur vertigo and vomiting.